Nominate a junior who has made a committment to on or off campus service, shows a willingness to take on tasks regardless of recognition, and demonstrates leadership. Recipients of this scholorship receive a $750 cash grant and a contribution of $250 given in their name to an organizaiton of their choice. Nominations for the 2017 Scholorships are now open. Click here to submit a nomination. In conjunction with the Moore Foundation and Barney II Foundation of Illinois, SPU has established a Servant-Leadership Scholarship to reward student leadership in the area of voluntary community and ministry service. Only juniors who are returning to SPU for their senior year are eligible for consideration. Up to four people will be awarded $1,000 scholarships each. The award includes a statuette, a $750.00 cash grant and a contribution of $250.00 given in the name of the recipient to a charity chosen by the recipient. 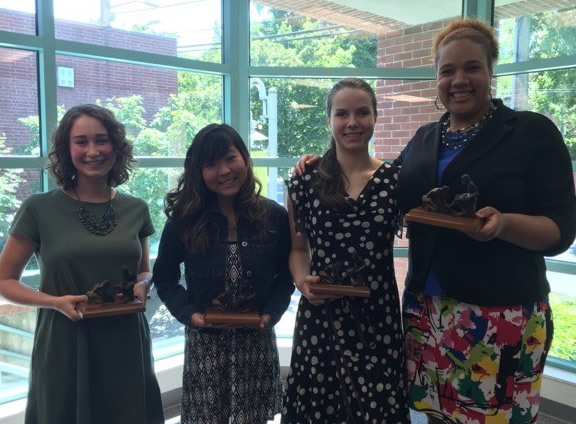 The aim of this award is to promote the ideals of servant leadership in the Seattle Pacific University community. Recipients of the Barnabas Servant Leadership Award are recognized at a reception held in late Spring Quarter. Attendees at this reception will include each award recipient, those who nominated them, their invited guests, and last year's recipients.